Most of the food and restaurants in Spain includes pork and alcohol as the main ingredient. Eating out in Spain can be challenging for those who don’t consume pork, alcohol or maintain a strict halal diet. With that being said, there are many popular as well as upcoming halal food and restaurant options in Madrid. I personally researched these restaurants, looking for a variety of national cuisines, halal certifications etc. Eating halal doesn’t have to be mediocre or mean suffering through bland tasting food. In this post, you will discover a range of some of the finest halal restaurants in Madrid to the most affordable. What all these options have in common are the food quality and delicious taste. Enjoy this list of mouthwatering halal food in Madrid, curated just for you. Right when you get off the Lavapies metro, you’ll find the La Alhambra. Not to be mistaken for the famous Alhambra palace, La Alhambra restaurant is often referred to as restaurante arabe en madrid, by Spanish speakers. 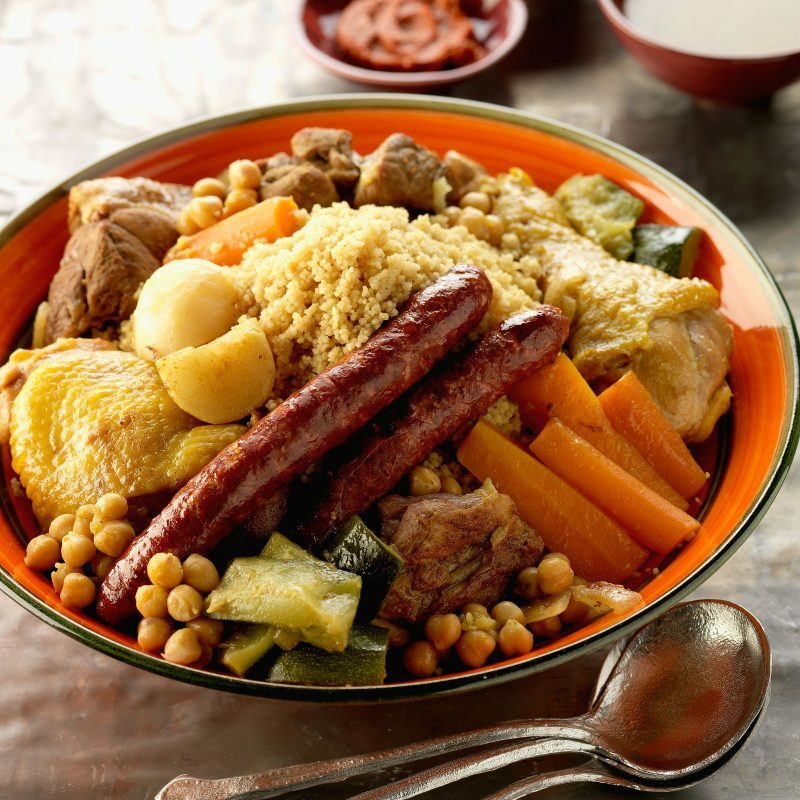 This local’s favorite spot serves typical Arabic dishes with a specialty of Moroccan cuisine such as delicious couscous, warm harira soup etc. locals recommend La Alhambra as one of the best for halal food in Madrid, particularly in the Lavapies neighborhood. Cost for a full meal is 7 € on average. It would be safe to rate Al Mounia as one of the top 5 restaurante arabe en madrid for its yummy halal food and homey feel. This regal restaurant is located in the city’s upscale neighborhood. While sitting in its spatial arena you can’t help but feel like royalty. The cost of the meals are a little bit pricey for an individual, however, there are several options for groups which makes it possible to enjoy one of Al Mounia’s savory and sweet dishes. The group meal includes appetizers, a main dish, desserts, and drinks. There is an additional special meal arrangement during the month of Ramadan. Description: If you are like me and are a little bit on the adventurous side, you might as well stop by Baobab. This is said to be the best Senegalese restaurant in the whole of Madrid. 92% of Senegalese locals are Muslim making their food permissible to eat for other Muslims as well. Besides offering halal food, there are also options for Vegetarians. Some of Baobab’s dishes consists of succulent stewed meat, well-seasoned fish and tasty vegetables. The Senegalese restaurants’ popular dishes are Thieboudienne, Thiere, and Yassa. The average costs of these meals are €7 and trust me, a trip here means that your stomach would be filled up for the whole day. A little bit of warning! Senegalese food, in general, tends to be on the spicy side, however, you can order a less spicy meal. Description: Another place that offers halal food in Madrid is Bombay Palace. It’s a desi restaurant with a variety of scrumptious platters common to this region such as Chicken/Lamb tikka, Vegetable Balti, Chicken Chaat; to mention a few. You can eat well here without breaking your bank. The manager is a Muslim and the majority of their dishes are halal. Description: Bar Colores is a smaller Senegalese restaurant located in the heart of the international neighborhood (Lavapiés) but with tastier meals. In addition, Bar Colores charges less for its meals in general than Baobab. I have been here twice and I know I would visit many more times. Their meals are simply delicious. If you happen to stop by on a hot day, make sure to try their refreshing Baobab drink. Let your mouth melt with the fresh and warm wheat balls filled with seasoned meat also known as Kibbeh from Lebanon or the sizzling home made Moroccan couscous. This halal restaurant in Madrid is a fusion of two and maybe three national cuisines. They even offer halal paella! Alquds is conveniently located in Gran Via, a popular tourist spot. Stop by to see what this restaurante arabe en madrid has to offer. Description: Although Nuria Restaurante Etiope doesn’t officially classify as a halal restaurant in Madrid, I would consider it vegetarian-friendly. Dip your hands in one of the numerous finger licking vegetarian dips (garbanzo puree, buttered spinach, pinto beans, sauteed veggie mix, sweet potatoes, sweet beet, fresh diced tomatoes, you name it!) all decorated around the wide circular sour Injera bread. Description: I consider Real Estambul to be Madrid’s version of Halal Guys NYC without the famous white sauce. Just by its name, you must have guessed by now that this is a Turkish restaurant. Real Estambul offers delicious Turkish meals like Kebab, Shawarma, Durum, Lahmacun to mention a few for an affordable price. Description: My final pick on this list of mouthwatering halal food in Marid is Sahara. It is a nice and comfortable restaurant located not too far from Madrid’s center. The typical food served here, have Moroccan influences. Customers love their Eggplant humus and Chicken Pastela. The average food cost in Sahara is around 15 € and above. El Barrio de Lavapiés is my recommendation for anyone who wants to try a diverse platter beside Spanish food. In addition, there are tons of other halal restaurants located in this neighborhood. P.s. If you want ask for Halal Food in Madrid or Spain in general, just say “Comida Halal”. This magic word will help you discover a Halal restaurant nearby. For tips on ordering food like a Spanish local check out this post.